Quickly and easily flip meats, poultry, and vegetables on your flat top griddle with this 6" x 3 1/4" flexible stainless steel slotted turner! This turner is perfect for flipping hamburgers, chicken breasts, and grilled vegetables, then removing them from the griddle. The stainless steel blade features slots that allow excess fat and liquids to drain from the product prior to serving. Rounded corners protect the product from punctures, preserving product quality to boost customer satisfaction. At the same time, the durable stainless steel blade is guaranteed to give you the longevity you need, and a special hardening process on the blade results in excellent corrosion resistance, too. These are a great quality, but inexpensive stainless steel turner. I like the shape of them and they seem nice and sturdy. Perfect for use in our HS culinary classroom. I bought this large turner to make indian breads, it gives nice grip . Work great and also nice quality and finishing. I always prefer stainless steel in my kitchen and i got here in large size. This is a solid spatula, however the grip is a little narrow. I would really like the handle to have been curved around the central axis as then it would be a lot easier to grip. Has held up well, easy to clean. These work perfectly in our restaurant. It let's us completely pickup and turn entire large portions of food without it falling apart. They are lightweight but sturdy and easy to clean. We have several, and highly recommend this product! A good and durable turner (AKA: Spatula) for use with cold or hot items, including griddle/grill needs. Easy to clean, a great price, and can handle heavy daily use. Ours have for a few years! Slots a decent spacing allowing French toast batter up on bread and allow excess out. Flexible but still sturdy. Easy To clean and nice length. Not ideal for non stick pans. I love my 6" x 3 1/4" Flexible Slotted Turner. I use it when ever I make grrilled fish or pancakes on the flat top. Sometimes when using a turner a lot of the oil and grease will spray around when I flip the food. But this product is great because now right before I flip my food I let the oil/grease/liquid go through and it allows me to flip it without getting that liquid everywhere. Love it. Same as the solid version, this spatula is perfect for chafing dish service. Clean enough to be seen, yet sturdy enough that it doesn't bend under heavy food. Perfect for wet or sauced dishes. I really liked the thinness and flexibility of this Turner. It easily slipped under my grilled cheese sandwich. I like the large surface area of it too. With a slotted blade that is 6 by 3.25 inches, this 14 inch long, silver colored Turner is super to use. The flexibility helps for turning and also for reaching under large cookies to remove them from a baking sheet. The stainless steel 0.7 mm blade has rounded edges. since the 6" x 3 1/4" Flexible Slotted Turner #92246934 is metal I won't use on my majority which are nonstick skillets but this does just fine (more than fine, it's flexible, thin but not cheap) on my stainless and other skillets and grills, it;s a well put together item, and I'm glad I ordered it. The six inch stainless steel flexible slotted turner has been a great addition to our kitchen. We were impressed with the non-flimsy but still flexible design. I appreciate the slots are not too large and not too small. The flipper can be used for pancakes as well as fish and even burgers. Very versatile and I would recommend them to anyone. A great slotted turner that helps drain some of the grease off the meat while I'm cooking so that I do not make such a mess on the counter. I was not looking to buy this but because they were so inexpensive, I thought I would buy one to try it out. I am happy with my purchased as it's dishwasher safe, rigid enough and it's stiff enough to hold the food item. I will definitely buy again. This flexible slotted turner is great for greasy food on the griddle. The handle is thick and well crafted and the blade is thin so it can easily slide under items on the griddle. Good turner - the handle seems to be welded on, not riveted, so I am not sure how long it will last, but it will definitely last long enough. The blade is very slim and would be good for eggs and pancakes, etc. I bought this for home use. This is the perfect size, super strong and durable. It looks and feel professional quality and I expect it will last a very long time. Love how thin the spatula part of this turner is! It works really well for getting cookies off of cookie sheets. I have been looking to turners that we thin enough to nicely slide under cookies, and am so glad I found this one! Built strong but also flexible. Allows us to make sure we really get underneath a food item to properly flip it with out any issue. This slotted turner is a lot more durable and sturdy than it looks. We had misgivings about it from the pictures, thinking it might be more flimsy, but it's strong and able to hold up heavier foods when turning. This turner is great because it is slotted and flexible. They are great for hamburgers and I love that you can really get underneath them due to the thinness of the turner. This slotted turner is nice and flexible. It makes scooping up cookies, casseroles, or cakes easy and doable. It's a great buy & we highly recommend it. the 6" flexible slotted turner is versatile, sturdy and durable. The spatula is thin and makes it very easy to flip and turn food, we mostly use it for burgers and other meat where we want to limit the liquid that we put on the plate. Used the 6" x 3 1/4" Flexible Slotted Turner to pick up a rib. The turner did not bend while holding the rib. It had no trouble with the weight. Very satisfied with the turner. Great pan spatula turner. The thin blade gets under food and scrapes it off the pan no matter how stuck it may be. Also works well to cut portions of soft foods before serving. Slots keep liquids in the serving pan. I use this 6" x 3 1/4" flexible slotted turner to flip my cheeseburgers. It has slots which allow the steam from our grill to permeate the meat. These Turners are our favorite style, we use them for everything. They work great for flipping meats, eggs, bacon, just about anything. We have quite a few on hand because we really like them. The only bad part is they tend to break where they are welded together. I ordered this flexible slotted turner but was sent the 6" x 3 1/4" Flexible Solid Turner instead. Since the price was low, I didn't bother complaining or sending it back. I end up liking the solid turner and didn't really mind too much. I bought one of these just to try it out. I was skeptical because of the low price. So far I have been pleased. Cleans up well, dishwasher safe, rigid enough to be durable, and the turner shelf is stiff enough to hold the product yet flexible enough to get up under it in a frying pan. I will buy again. I think the fact this turner is flexible. Some are too thick and stiff for my liking and I think they are more difficult to get under food when cooking like pancakes and scrappel. This turner is well built, and the blade itself is really sturdy. I've used other turners that were too flexible, but this is tough enough to scrape out browned bits of meat yet bends to slide under burgers and such. The slots allow grease to drain out and stain in the pan. Good purchase. This turner is flimsy at best. It works well for picking up light objects, such as small brownies and such. It does bend easily so it is NOT for heavy duty jobs. I bought this to use at home. I am not a professional. This item does not have a fancy padded silicone handle or other cushy details that home cooks might be used to, but it's a good price and it does the job. I like that it's slightly flexible. Also I always put it through the dishwasher and it comes out fine. Standard spatula pretty much, they last a good well for the price! These generally hold up pretty well. The handle is a bit thicker gauge metal than most other brands, but the weld has a tendency to fail after a few months. I bought this turner because I was looking for a thin, flexible turner that was priced economically priced and this one fits the bill! It is very thin and handles delicate and light tasks beautifully. It washes up great in the dishwasher, and the price is excellent ! 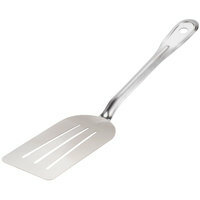 This is a nice spatula for fish because it is slotted and flexible. Nice for quickly grilling items and turning buns on a flattop griddle. This slotted turner is a great size and very sturdy. Nice to be able to hang it when not in use. I'll be buying more soon. Nice handy flexible slotted turner for the price! A price that can not be beat! Nice for delicate items like crab cakes and fresh fish!! This is a great turner for the price, I honestly do not use it frequently but I do use it sometimes when I have to. I use this turner to scrape the griddle and Pyrex glass casserole pans a lot from the leftover grease. It is a handy utensil to have around and the price is excellent; that makes it a great value. Stainless steel turners will cost you more in a retail store or a department store.